The latest video by Bad Bones, “Midnight Rider”, once again consolidates the hard rock band’s load of relentless energy. Lead singer Max Malmerenda sounds better than ever – his vocals right high up in the mix – and the venerable guitar of Sergio Aschieris cuts through with conviction. Lele Balocco delivers a smart mix of speed and traditional classic hard rock drumming, while brother, Steve Balocco’s bass-rumble drives Bad Bones’ rhythm as always. Die-hard fans of hard rock and metal will embrace this, and those with an appreciation for the qualities that make contemporary rock and metal compelling along with an acknowledgement that the melodic leanings of the 80’s power sounds were integral in pushing the message to a broader audience will find “Midnight Rider” both technically and stylistically stunningly authentic. “Midnight Rider” may just be my favorite song on the “High Rollers” album – both lyrically and musically – because it has the classic hard rock riffage that is just so irresistible. The guitar solo in this song alone is so classic that you would swear you’ve stepped back in time. You hardly hear this kind of playing style anymore. 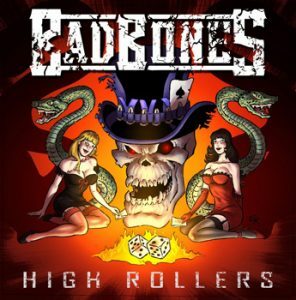 Bad Bones have made a super heavy record with hooks and grooves in all the right places. One minute you are banging your head then the next you are singing the chorus. The choruses often utilize rhythm-intensive, lunging riffs to spike the adrenaline in favor of sustained chords and a gleaming melody. A cinematic and empowering song that surges with an anthemic refrain and layers of vocal harmonies, “Midnight Rider’s” surgical, rolling riffs and fills before and after the climactic solo buildup showcases Bad Bones’ ethos of paying attention to every sonic detail. The first thing you’ll notice about the track, is how insanely huge it sounds, as the band draw out their finest, most fiery performances imaginable. “Midnight Rider” is ruthlessly contemporary and gleams with an almost classic polish, delivering more punch per square sonic second than most of the band’s contemporaries have wielded in a long time. But as dazzling and monstrous as the production is, Bad Bones’ true brilliance lies in the song performance itself. 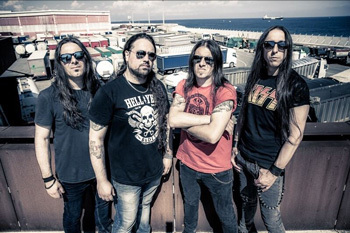 Comfortable in their tee-shirts and jeans in the video, this is the sound of Bad Bones connecting with what they do best: honing and crafting music until they hit peak hard rock efficacy. The vocals soar and scream, while the rhythm section is tighter than two coats of paint. And it’s all done and dusted within four and a half minutes. That’s all the time Bad Bones need to deliver hard rock in its untainted form, and with a confident attitude. It’s the sound of a band treading familiar territory and paying homage to the past, while sounding relevant and looking to the future. “Midnight Rider” is an excellent single supported by a video clip that further validates Bad Bones’ claim to classic hard rock authenticity in today’s musical climate. The band’s performance proves that Bad Bones pack some heavy artillery and can hit the target – bullseye on every shot! Grand Rezerva: “Hellhound” – unpretentious, raw, no frills authenticity!